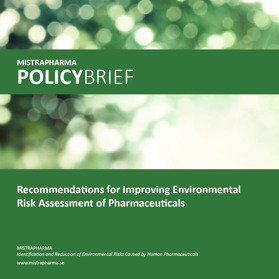 The MistraPharma research program proposes 10 recommendations for improving environmental risk assessment of human pharmaceuticals. The recommendations are based on up-to-date scientific knowledge concerning pharmaceuticals’ effects and presence in the environment, as well as experiences from the REACH-framework that regulates industrial chemicals. Download the policy brief here or read abour our recommendations below. We recommend that environmental risk assessments are performed also on pharmaceutical products approved before the European Medicines Agency’s guideline came into force. There is simply no scientific evidence that products put on the market before 2006 are of less environmental concern than new products. We recommend that pharmaceutical companies that produce or import the same pharmaceutical substances submit a joint environmental risk assessment instead of submitting one per company. This would provide decision makers with coherent information, avoid duplication of work and reduce animal testing. We recommend that environmental risk assessments also consider the total exposure for groups of pharmaceutical substances with similar modes of action. This would enable a more accurate assessment of the environmental risks. We recommend that environmental risks are included in the risk-beneﬁt analysis when a product is considered for market authorization. This would make the assessment of risks associated with the use of pharmaceuticals more complete and hence more accurate. We recommend that the risk associated with discharges from manufacturing sites is included in environmental risk assessments. This would enhance the relevance of the assessments by including the part of the product lifecycle responsible for the highest environmental concentrations detected. We recommend that information that enables assessment of the risk for increased antibiotic resistance development is included in the environmental risk assessment for antibiotic substances. 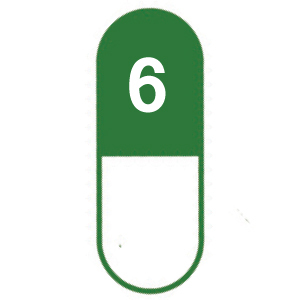 This would provide a more accurate picture of the risks associated with environmental occurrence of antibiotics. We recommend that the test approach is reﬁned to include pharmacological and toxicological data from the drug discovery process, as well as bioconcentration data. This would improve the prioritization process for further testing so that ecotoxicity testing is focused on the most problematic substances and the most relevant test organisms. We recommend that research studies of sufficient reliability and relevance are used in the environmental risk assessment. This would make better use of the available knowledge and could provide decision makers with important information. We recommend that environmental risk assessments must be updated when signiﬁcant new information is available. This would bring forward the regulatory use of new scientiﬁc data and may also increase collaboration between stakeholders. We recommend that environmental risk assessments and information about manufacturing sites are made publicly available. This would enable use of that information for other purposes such as research and external evaluation, and it would encourage companies to take more environmental responsibility throughout their supply chains.